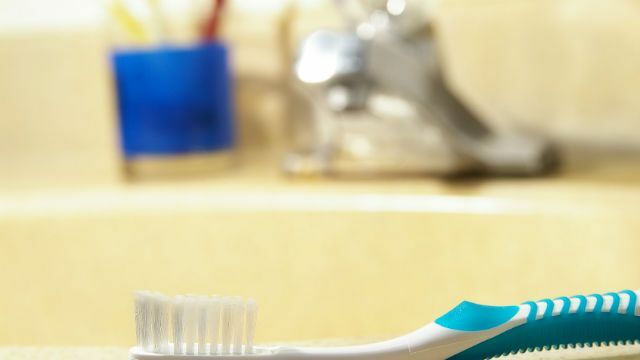 There are lots of healthy bathroom habits you probably follow every day, like washing your hands and flossing your teeth, but there are some that many people develop that may actually be harming their health. Are you guilty of any of these bad bathroom habits? Letting mold build up on your shower curtain. Because mold and mildew thrive on dark, wet surfaces, they tend to grow quickly on shower curtains. Breathing them in can trigger allergy and asthma symptoms. You can prevent this by running a fan while you’re in the shower or opening a window, which allows the air to circulate. Mold, mildew and even soap scum that is left unattended can potentially cause a serious infection, so it’s important to clean your shower curtain and liner on a regular basis. If it can’t be removed, it’s time to replace it. Leaving your toothbrush out near the sink. Your toothbrush really should be stored in a medicine cabinet or drawer. Each time the toilet is flushed it will get sprayed with bacteria that can get into your mouth when you use it. 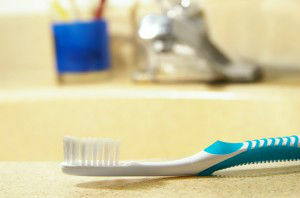 Dry the bristles off after every use and put it away, eliminating this really gross habit. Flushing with the lid up. Every time you flush, those germs and other particles become airborne, as mentioned above. Lowering the lid before flushing can help limit the amount that gets into the air. Keep in mind, this doesn’t mean you can leave out your toothbrush, as there are still some microorganisms that will be floating around. Not changing towels frequently enough. Your hand towel harbors bacteria, and when used around the eyes or mouth it can transfer from the towel to you and make you ill. It should be changed at least once a week. Your bath towels should be hung dry after each use and changed out after three uses. Using Q-tips inside your ears. The label on a box of Q-tips clearly reads that you shouldn’t insert the swab into your ear canal as it can cause injury, but many people ignore this warning. This could potentially rupture the ear membrane, and is likely to just push wax deeper into the ear canal, which means it will have to be professionally removed. It isn’t necessary to use a cotton swab at all, as earwax naturally moves toward the opening of the ear canal and is washed off when you shower. Not washing your hands. We’re sure you already know this, and have probably already gotten in the habit of washing your hands every time you go to the bathroom, but it’s worth repeating. Washing your hands has been proven as the most effective way to prevent contracting and spreading disease. Don’t use antibacterial soap, which contains potentially harmful compounds and may be ineffective. Instead, use warm water and soap to reduce bacteria on your skin. This lessens your chance of catching the common cold, flu, strep infections and other illnesses. Transforming bad bathroom habits into good ones takes just a little effort to potentially prevent lots of misery. Hey Buddy!, I found this information for you: "Why You Should Put the Lid Down Before You Flush and Other Healthy Bathroom Habits". Here is the website link: https://www.thealternativedaily.com/put-lid-flush-healthy-bathroom-habits/. Thank you.